Sipping from a small plastic bottle containing crystal sparkling water with sparkling molecules jostling for space each time he lowered the attractive container towards his mouth but his facial expression signaled a troubled mind; and manacled in a deep thought of what best action to take towards resolving the puzzling issues concerning some unexplainable misdemeanor of some persons, which sometimes appear as though they were contracted by devil himself. After quietly hearing from the opinions and feelings of those concerned; diffusing that tension with what seemed a sigh of relief for a man who has largely proven to have always been in control of his emotions, he calmly let it out to the worried and concerned persons; “I know that I am a deputy governor. I am also aware of powers at my disposal but how would that solve the problem of making them to understand. I will prefer to know why they did it so as to know how I may have offended them. This will also allow me explain myself so as to put the records straight. 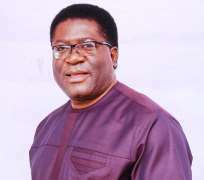 These were words muttered by Prince Eze Madumere when a certain Publisher erroneously published a misleading material, which brought about heated exchange in the system. On the day The Prince hosted Owerri based newspaper publishers, the young man in question was also in attendance. When one of the publishers pleaded his colleague’s case, Prince Madumere did not only forgive but took time to explain his own part of the story. This did not only endear him to the man in question but the man also is now a friend and a strong advocate. According to John F. Kennedy, he said: “ When written in Chinese, the word 'crisis' is composed of two characters. One represents danger and the other represents opportunity. Like the incumbent Deputy Governor of Imo State, Prince Ezeakonobi Madumere, though crisis portends serious danger in human relations but therein lies great opportunity to address other issues that might be of mutual benefits. This is where leadership and management prowess come in. It is undoubtedly so that Prince sees crisis, however potentially dangerous, as an opportunity for a sustainable rewarding relationship if not a means to an end. This has been Madumere’s style. Those who had axe to grind with him and even the government ended up becoming most reliable allies. One of such diplomatic missions was the squabble between Irete Community and Nigerian Bottling Company Plc. Due to the highest level of leadership laced with transparency, honesty, sincerity of purpose, the beverage giant did not only see through Madumere that selfless service with sacrifices, they saw the need to be socially responsible to their host community that embraced them. That peace effort for over five years has brought lasting peace in the area as the beverage firm has continued to empower the locales in appreciation of their hospitality. The value chain is huge as youths in the community have become gainfully employed while others have also be trained in various skills thereby, engendering peace and harmony while reducing the crime rate in the State. On the part of the firm, they were able to redeem their nose-diving image with no threats of shutting down their plants at various inconvenient times. This principle of always seeing the eye of the doughnut in every issue can only be found in ill-equipped pseudo-leaders who are too afraid to engage challenges as they come. When the news that the hope of the State benefiting from Rural Access and Mobility Project (RAMP) had been dashed, it was rather a gloomy situation that brought sadness in the minds of some Imolites who understood the inputs RAMP could make in infrastructural development at the rural areas. People cried out. Without falling into the temptation of telling tales of blames, it was discovered that World Bank had totally withdrawn from the state over established cogent administrative reasons. Prince Madumere rather than join in the wailing fray; it was indeed a great opportunity to fight the cause; to work out a lasting solution. That single decision changed the tide in Imo because Prince Madumere championed the enactment of due process act – fiscal responsibility act, public procurement act among other legal frameworks, which changed the image of the State for the better. He religiously followed up on the successes made and today, the State can boast of numerous developmental projects like NEWMAP, which has intervened to reclaim badly eroded lands, FADAMA to aid agriculture, agribusiness and allied agro industries, RAMP, which will be aiding the State to construct over four hundred kilometers of road adopting the latest technology in road construction to mention but few. While the space may not permit this writer to make an exhaustive enquiry into the success story of Prince Madumere attributable to his administrative acumen and strength of character, which has remained his guiding principle, it is noteworthy to point out that Imo Deputy Governor is a man of Integrity. To put an icing on the cake, Madumere, as a team player, is yet to fail in in-house keeping for any of the team or group he is part of. This is so because of his ability to troubleshoot any challenges and fix it before it gets to rupture-point. Addressing a cross section of party faithful recently who were embroiled in a seeming irretrievable squabble, Madumere rather than take sides, encouraged them to keep an open mind to whatever objections from members. While many still feel amazed how he has been able to work closely with Owelle Rochas Okorocha for over two decades without any record of any major crack, it is one case study that will surely define how meticulous the incumbent Deputy Governor of Imo state can be in proactive situation management and elasticity of his patience if not perseverance. I can recall Madumere’s mastership in political sagacity and crisis management in 2011 during the horse trading to allow Governor Okorocha fly the flag of All Progressives Grand Alliance. Yes, he is never quick to making statements; he really proved he was a leader of result not by hook or crook but by unleashing negotiating tools as obtainable in international best practices. These principles, however, scarce they may seem in the political and business circle, these could just be the secrets of ‘2018 Integrity Man of the Year’s success story.